Functional Nutrition and Functional Medicine is a relatively new model that revolves around addressing the root cause of a condition, rather than looking at symptoms. 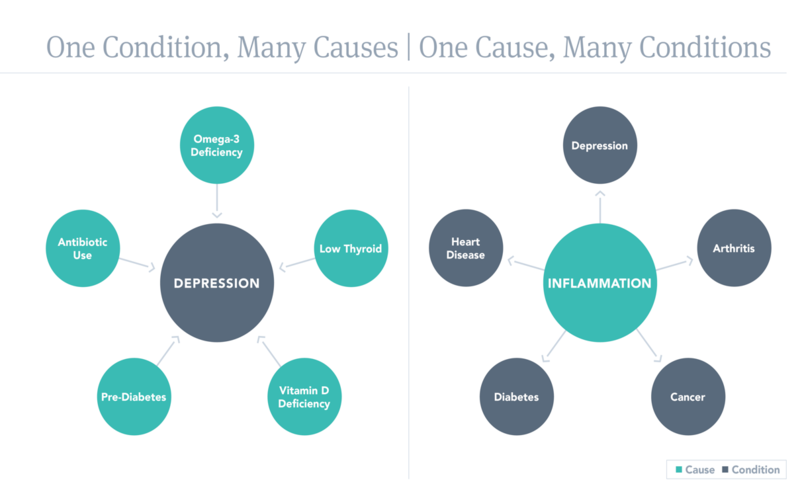 The Functional Medicine model is an individualized, patient-centered, science-based approach that empowers patients and practitioners to work together to address the underlying causes of disease and promote optimal wellness. It relies on a detailed understanding of each patient’s genetic, biochemical, and lifestyle factors and leverages that data to direct personalized treatment plans that lead to improved patient outcomes. The Functional Approach effectively deals with chronic concerns that often times have been hard to address for people. By addressing the root cause and not simply providing a band aid, clients understand where problems may have started and learn what they can focus on to overcome their concern. The Functional Approach may utilize excellent functional testing that can pinpoint deficiencies and abnormalities and provide answers to complex health concerns. The goal is to educate and empower each client into improving their health with the use of nutrient dense foods, natural supplementation and lifestyle recommendations. As the graphic illustrates, a diagnosis can be the result of more than one cause. For example, depression can be caused by many different factors, including inflammation. Likewise, a cause such as inflammation may lead to a number of different diagnoses, including depression. The precise manifestation of each cause depends on the individual’s genes, environment, and lifestyle, and only treatments that address the right cause will have lasting benefit beyond symptom suppression. Whether you’re looking to improve your diet, lose weight or deal with a chronic concern, the functional model will help you. Start today by scheduling a free strategy session to learn more about benefits, pricing and package options.